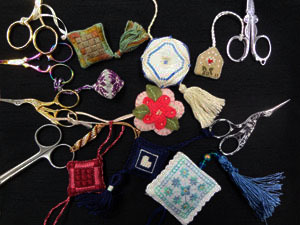 The deadline is April 30, so there’s still time to stitch up a scissors fob and get it in the mail for the EAC’s annual exchange. The maximum size is only 2.5 by 2.5 inches so it won’t take long to stitch up a little something. You can find details about the exchange on the EAC website. To finish the scissors fob, you can use the PDF instructions on Kathrin Elliot’s blog (look for the link just under the photo of the beautiful box). The tutorial was prepared by Kathrin and EAC member, Kim Beamish. Kathrin is the daughter of Gitta Al-basi and the owner of Gitta's Charted Petit Point. Thank you to Kathrin for allowing us to share this resource with EAC blog readers.